There may be a new competitive sabotage scam going around the SEO industry around link removals. You know how Google sends link warning emails? Well, when Google does that, you should see the notification also in your Webmaster Tools message center, if you don't then it typically was not sent by Google. 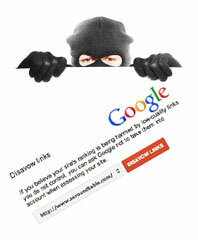 One such webmaster claimed he received the warning and immediately went about removing links to his web site. After doing so, he submitted a reconsideration request, in which Google responded he had no link penalty from the onset. Meaning, the link warning he initially received may have been a scam email from a competitor. So I assumed it was real. But now... after working on removing all these links - I feel like a fool because within two days Google comes back and says - "no web spam penalty". I feel like a total idiot. Truth is, he may have received a legit notification but this should be a warning to other webmasters and SEOs. If you get a warning, make sure it is legit before you start destroying your link profile and weight.